Middle age folk dance group “Mārupieši” is celebrating their 25th anniversary on 2014. 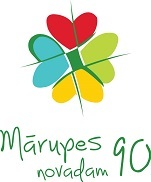 Ever since the foundation in 1989 “Mārupieši” have participated and performed in different folklore events and concerts every year and also in All-Latvian Song and Dance festivals that is held in Latvia every five years. Besides local concerts “Mārupieši” have travelled and popularized Latvian folk dance traditions abroad. With our charm, dancing skills, beautiful ladies and handsome gentleman we have moved to tears spectators even in such exotic countries as Malaysia, Nepal and South Korea and China. Charismatic and attractive Gunta Skuja has been the artistic leader of folk dance group “Mārupieši” for more than 20 years. She’s a well known choreographer in Latvia, author of several dozens of new folk dances and multiple times have been the chief artistic leader of All-Latvian Latvian Song and Dance festival. Gunta Skuja has put all her love, talent, energy, originality, sense of humour and diplomatic talent to render folk dance group “Mārupieši” one of the best-known folk dance groups in Latvia. Mārupe is a municipality and a town in the middle of Latvia, near the capital city Riga. It is characterised by intense construction in living areas and on industrial sites, though haven’t lost rural landscape or agricultural traditions. However culture life is also very vast. There are several amateur groups of different interest for kids, youth, adults and seniors. Many of those groups, including folk dance group “Mārupieši” rehearse in Mārupe Culture centre. You can see our pictures and videos. Feel free to contact us in English, Russian or Latvian.